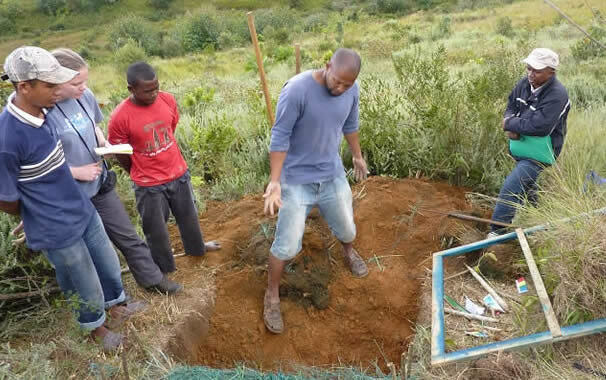 The p4ges team in Madagascar works under the authority of the Ministry of Environment, Ecology and Forests. M. Hiarinirina Randrianijahana who is responsible for research in the Direction Generale de Fôrets visits researchers in the field wherever possible and last week we invited him to spend a few days in the field with the p4ges team. M. Hiary was very interested in the hydrology team’s work. He asked lots of questions about the exact purpose of the blue dye infiltration experiment and was reassured to learn that the dye we use is entirely harmless to the environment -in fact it is used to colour blue candy so you can eat it! Maafaka Ravelona from the hydro team explained how this experiment allows us to investigate how the proportion of rain which runs over the land (possibly causing erosion and flooding) relative to the proportion which sinks into the soil (allowing slower release into rivers) depends on vegetation. M. Hiary was able to discuss the progress of the biodiversity team with the team leader in Madagascar, Christian Randrianantoandro. He also visited Mahatsara; one of the social team’s pilot villages where we discussed the tools the social and economic teams have developed and how we have been introducing the project locally. The visit was really positive. M. Hiary made some excellent suggestions about how we can communicate the hydrology research locally. He also provided some really useful leads about possibly useful baseline datasets which may be available. We look forward to continuing to work with him and his colleagues.